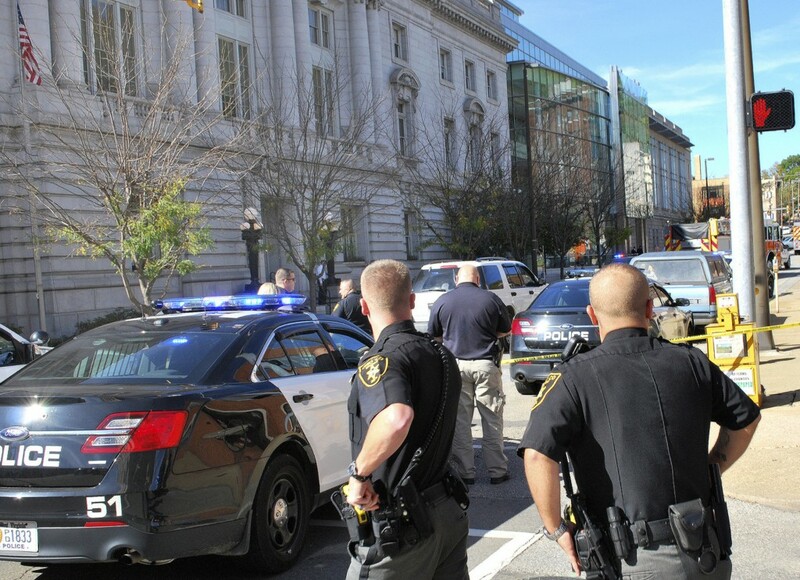 Ex-cop killed after firing at US courthouse in W.Va.
People inside the building ducked under desks as the shots struck the building and shattered windows. Three security officers were injured by flying debris. WHEELING, W.Va. — Investigators said they are trying to determine why a retired police officer fired up to two dozen shots at a federal courthouse in West Virginia on Wednesday before officers returned fire and killed him. Wheeling Police Chief Shawn Schwertfeger identified the gunman as Thomas J. Piccard, 55, of Bridgeport, Ohio. He was a retired Wheeling police officer. Piccard was armed with an assault weapon and a handgun. But Schwertfeger did not say whether Piccard used both weapons during the assault on the Wheeling Federal Building or speculate on a motive. Officials said they had no knowledge of any sort of note left behind by Piccard. Three on-duty security officers were injured by flying debris during the onslaught, he told a news conference. Investigators were seeking a search warrant for Piccard’s home in hopes of determining a motive and if he acted alone, said Chief Deputy Mike Claxton of the U.S. Marshals Service in northern West Virginia. Wheeling Mayor Andy McKenzie said police who briefed him earlier Wednesday told him that Piccard was a 20-year-plus veteran of the force who retired 13 years ago. Claxton said a man later identified as Piccard began firing from a parking lot across from the federal building. “He was observed in the parking lot very quickly after the first shots were fired,” he said. The building houses a variety of courtrooms and related offices, including those for judges, prosecutors and law enforcement. Officials said it was too early to tell whether Piccard was targeting anyone in the building or what his motive may have been. “That’s still trying to be determined,” said Bob Johnson, the assistant special agent in charge of the FBI’s Pittsburgh office. People inside the building ducked under desks as the shots struck the building and shattered windows. U.S. Attorney Bill Ihlenfeld said shots were fired into at least three rooms in his office on the building’s second floor. He described hearing gunshots, then panic among staff. “Members of my staff were crawling on the floor or running from office to office telling people to get away from the windows,” he said. Ihlenfeld said he knew Piccard from 1997 until the officer retired in 2000. He said he had no reason to believe his office was targeted, and that Piccard was not under any sort of investigation by federal authorities. “There was nothing about my relation with him or anything that I observed in dealing with him … to cause me to think anything like this would happen,” he said. About 40 percent of Ihlenfeld’s staff was furloughed because of the federal government shutdown, so many weren’t working on Wednesday. “To be honest, the security plans in place to deal with a situation like this don’t work when we don’t have everybody there,” he said, without elaborating. Carla Webb Daniels told media outlets she was in her attorney’s office nearby when she heard loud gunshots. She saw the gunman fire from a bank parking lot across the street. Piccard’s body will be sent to the Medical Examiner’s Office in Charleston for an autopsy. Meanwhile, officials continued to search his four-door sedan that he drove to the scene and his trailer across the river in Bridgeport, Ohio. Johnson said a bomb squad would clear the home before investigators go in as a precaution. Most people were going about their evenings, eating at local restaurants in the small city of about 28,000 that has an older downtown with stone buildings, banks and coffee shops. Only a few stopped to gaze at the courthouse. David Wohlfeil, the owner of the Metropolitan City Grill near the courthouse, said he ran outside after he heard the first shots. He heard two more volleys of gunfire then ran back inside. Wheeling has been hit by layoffs in the steel industry and its population dropped by about 9 percent from 2000 to 2010.